AMSONIA offers a wide range of products and varieties. Besides the traditional and popular varieties, our company is able to offer every season a large amount of new trials. It is clear that supplying top quality is most important to survive in our business. We also believe that, to grow quality flowers, we have to maintain close relations with our customers and service and guide them where and when possible. On this website you will find guidelines on growing and other use-full information. Furthermore it is also possible to order in our company products that help you to grow top quality flowers: e.g. trays, netting, sleeves, pots, machines for planting and harvesting (second hand or new). Please click here to get an overview of our products. In the menu above you can read more about our service and support. Since we started our company in 2002, the focus has been on supplying our customers with the highest quality flowerbulbs from top-soils in Holland. 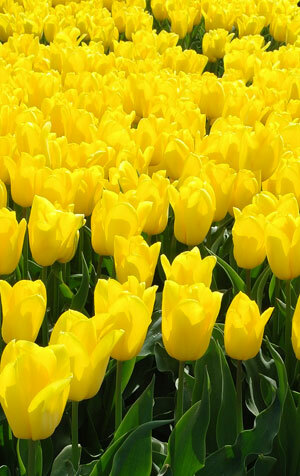 Our main products are bulbs from Tulipa, Lilium, Iris, Gladiolus, Crocus, Hyacinthus and Narcissus. Besides flowerbulbs we also supply young plants and seedlings of various flowercrops and (bedding)plants. Popular in this range of products are Lisianthus (=Eustoma), Poinsettia, Cyclamen, Azalea, Chrysanthemum, etc. We also have close contacts with breeders of trees and shrubs in all sizes available (e.g. Juniperus, Pinus, Thuja). Due to our constant and guaranteed quality, we have become one of the biggest suppliers of plantmaterial in Russia, Ukraine and other Eastern Europe countries. A top quality product needs a competitive price! Only this way we can keep our customers satisfied. AMSONIA is the reliable partner where it comes to quality, price and service. Based on this we have been able to expand our sales each year. To keep our position in the market, we work closely together with the best bulbgrowers and breeders from Holland which are situated close to our company. We look forward to work with you and wish you success with our plantmaterial.